Are you a dab hand with a paint brush or like putting up shelves? If you can spare a couple of hours a week to help with any odd jobs then please get in touch. We are currently looking for volunteers that could support a student within the front of house area of the cafe. Experience not essential, though you must be willing to assist our students in any job required. We currently have no vacancies for volunteers working in the Café. Please watch this space as vacancies do become available. We are currently looking for volunteers to assist the activity leader every Friday from 6:30 till 8:30. 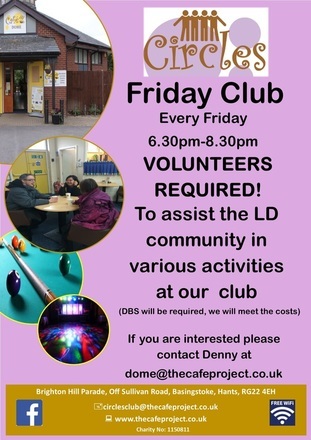 If you are able to help with various activities or spare some time on a Friday evening then please get in touch with us. Please note that you will be required to undertake a DBS to carry out a volunteer role at the Café Project but we will meet any costs involved.